The mixologists at Stag Lounge in Oklahoma City utilize fresh ingredients to craft special cocktails for their seasonal menu. As people become more conscious of their eating habits, restaurants and brewers have responded by providing interesting, fresh, local and environmentally friendly cuisine and craft beers. Bars specializing in craft cocktails are a natural extension of this farm-to-table and craft beer movement. 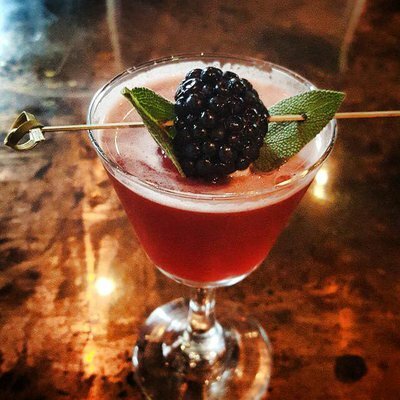 Like their fellow artisans creating quality food and beer, bartenders, or mixologists, as some prefer to be called, at these craft establishments take their drink slinging very seriously. With an emphasis on smaller label, often regional, spirits and handmade mixers, a DIY attitude permeates the whole movement. Whether it’s making their own cola or ginger beer, infusing fruit, vegetables and sometimes even nuts into liquor or creating their own tinctures and herbal extracts, these mixologists work their alchemy, respectfully replicating historical libations while pushing the boundaries, crafting your favorite new cocktail. Valkyrie takes its drinks very seriously. Just about all the bar’s mixers - syrup, tinctures and juices - are made in-house and sourced from only the finest wholesome and fresh ingredients. All the standard mid-century cocktails (think mai tais, manhattans and sidecars) are represented, but this bar’s menu runs deep, mining classic punches straight out of the bartender’s bible, 1862’s Jerry Thomas’ Bartenders Guide. While Valkyrie respectfully carries the barkeepers’ torch from decades and centuries past, they continue moving their craft forward with house-created cocktails like the Churchill in a Basket, Elixir #3, The Falling Soldier and Golden Years, to mention a few. Not sure which way to go? Trust your mixologist and order the Workshop Cocktail, a libation that is the bartender’s choice. Whatever you decide to get at Valkyrie, sit back and watch these mixologists create magic in a cup. Much like Valkyrie, Mixed Company is intensely focused on creating perfect craft cocktails by shaking up equal parts history, playful creativity and house-made mixers. Choose from 13 house specialty drinks including the Peanut Old Fashioned, featuring peanut infused Bulleit Bourbon, the Army of Me, a bravado inducing vodka and wine concoction sweetened with a tea tincture or try the Acuff Rose, a gin delight mellowed with lavender syrup. In addition to the standards, the classic cocktail menu features vintage treasures like the Blood and Sand and French 75. With the bars well-curated spirit, whiskey and scotch selection, the mixologists probably have your favorite liquor on hand to craft a perfect cocktail just for you. Although this Brookside establishment has an impressive selection of craft beer and pub food, the libation menu at R Bar shouldn’t be ignored. For starters, the bar’s mixologists infuse bourbon with peaches, creating “R” Old Fashioned, their take on the timeless classic. House-made lavender bitters star in the Lavender Sour, a concoction of Hendrick’s gin lemon, lime and simple syrup. The house-made ginger beer (not to be confused with its weaker cousin, ginger ale) is crafted from scratch and is refreshing enough to drink all by itself. Enjoy their ginger beer poured up in a copper mug and paired with vodka in a hearty Moscow Mule or partnered up with Hendrick’s Gin in the Gin Gin. Hodges Bend combines two mainstays of the craft movement: coffee and cocktails. Directly tied to the coffee roaster Topeca, the bar approaches mixology from the scientific perspective of a coffee roasting barista. Like all craft cocktail places, Hodges has their share of egg white blended, creamy exotic drinks such as the tequila and lavender based, Maderista or the rye, Absinthe and hibiscus infused Dark Passenger. Try the tobacco bitters with rum in the Tobacco Old Fashioned or the sweet and savory 3rd Street Sour, blending up the unlikely quartet of scotch, maple, lemon and jalapeno. When you’re drinking with a group, the bar also offers a pair of punches: the gin based Garrick Club Punch and the Bombay Government Punch, a delightful mixture of rum and cognac. Stop in to Hodges Bend for an expertly prepared coffee and then kick back and enjoy one of their well-crafted cocktails. Of course, the barkeep can whip up a martini or gimlet, but check out their menu before yelling out your old standby. Located in an old bank building, The Vault and its bar, Tom Tom Room, distill space age sensibility into an unapologetic mid-century lounge. The tightly focused bar menu almost exclusively features atomic age cocktails such as the classic martini, brain duster, rusty nail or mai tai. At this bar, the mixologists create their own tonic, shake it up with Tanqueray, grapefruit, pepper and star anise and pour it up as the Gin Tonica. Enjoy one of The Vault’s punches with a group of up to ten people. The potent Artillery packs a punch with an explosive mix of rye, rum, gin, cognac, benedictine and champagne. Tom Tom, the bar’s namesake punch, features a choice of Tito’s vodka or Hayman’s Old Tom Gin, magically blended with lemon, orange flower water and served with an ice ring. Built in historic Automobile Alley, the neighborhood bar Sidecar warmly reflects the history of the district. Although their cocktail menu isn’t extensive, it’s a treat to watch this bar’s mixologists expertly prepare libations, especially the manhattan or old fashioned. Order up the Maker’s Mann-hatty or Old ‘Smokey’ Rye Fashion and the barkeeper will place your glass over a lit piece of cedar, capturing the smoke and blending it with the complex woodiness of the whiskey. Marvel at the luminous colors in the expertly prepared 1905 Modern cocktail or the bar’s namesake Sidecar. Enjoy the classic ‘Okie’ Gin & Tonic crafted from Oklahoma’s own Strong Tonic and Loyal Gin from Prairie Wolf distillers. Local and seasonal are the defining elements of this inner city bar and restaurant. From the beginning, Ludivine has stubbornly insisted on sourcing everything local when possible, and this commitment extends to their bar menu. Though it doesn’t change as rapidly as the restaurant menu, expect their drink selection and ingredients to seasonally shift based on availability and peak freshness. From ginger beer to infusions and tinctures made from exotic ingredients like tobacco and jalapeno, the creative mixologists at Ludivine craft most of their own drink blending materials in-house. Of course, the barkeep can whip up a martini or gimlet, but check out their menu before yelling out your old standby. Chock full with a broad selection of delicious house created craft cocktails, Ludivine’s seasonal menu boasts jewels such as the Jalapeno Hemingway, Garrison Finish, Green Garden Fizz or 3:10 to Yuzu. With over 400 spirits and 175 different bottles of whisky, Stag Lounge can craft just about any cocktail imaginable. Located in the heart of the Deep Deuce District, this cigar bar is the perfect place to escape downtown’s fast pace while winding down with a quiet, meaningful conversation over drinks. With such an expansive, well-curated selection, it’s difficult to resist the temptation of ordering a neat whiskey or scotch. Instead, give one of the house cocktails a shot. Stag’s mixologists work hard to create unique, seasonally rotating libations. In addition to mastering flavor profiles to craft the perfect drink, pop culture sensibility comes into play when naming the creation. For example, Stag's cocktail menu last winter included drinks with classic winter movie references: You’ll Shoot Your Eye Out (A Christmas Story), Punxsutawney State of Mind (Groundhog Day) and Who Forgot Kevin (Home Alone). Plugged directly into the Farmer’s Market District, the Power House obtains its raw menu ingredients and coffee from market neighbors. This commitment to local sourcing is expressed in the bar with a menu prominently featuring regional craft beer and cocktails crafted from locally distilled spirits. Blending champagne, organic Prairie Wolf gin and Oklahoma sorghum, the bar’s mixologists create the Cherokee 75, which is a French 75 with an Okie accent. For dessert, try The Sickle, a delightful blend of half and half, Prairie Wolf coffee liqueur and Baileys. Spice things up a bit with the house-made ancho/habanero syrup - mixed up in the Spicy Sexton Rita, this cocktail puts a Sooner spin on the classic margarita. Featuring a fantastic patio, you’ll be hard-pressed to find a better way to enjoy a few cocktails than Power House. Norman’s Scratch Kitchen & Cocktails is passionate about fresh, flavorful ingredients. True to its name, the bar creates many ingredients from scratch, freshly squeezing juice, crafting their own syrups in-house and cracking a fresh egg or two to create the ultimate cocktail experience. The bar menu changes seasonally but is carefully designed to allow the palate to progress from light and refreshing to bitter and dry, then finishing on a sweet note. The mixologists at Scratch also work closely on menu formulation with slow crafted bitter company Bittercube. Founded by a Norman native, the influential company not only makes quality bitters, but also creates signature craft cocktails.